Windows capitalises some of the folders when putting it on the PSP, this made the game bug out when loading towers and enemies. 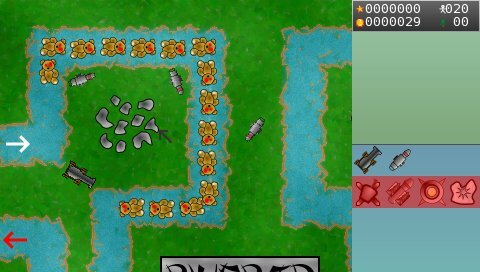 For my neoflash entry this time, I’ve made a fully customisable tower defence game for the psp. The level creation guide is included, please make lots of levels! 😀 😀 :D.
Surreal for the build menu graphics. thefamilyman and Dapples for hosting the downloads! I’ll release the source under GPL including the SVGs I made the images from (under CC) sometime over the next week, will set up a SF.net project or something for it. This entry was posted in DSP, PSP on August 20, 2007 by Danzel. How do you install the thing onto the psp!?!?! I cant install ! is a computer REQUIRED ??? or is there a way to install directly from the PSP! ?